for the language he best hears is silent love. I was reading about St. John of the Cross. He made many crucifixes by hand and hung them in his room. He was devoted to the image of the crucifix, and saw it as a reminder of the sacrifice we should make and that we should not ask Christ to remove our crosses that we bear. Gardenia - Wow....I never knew that. Thank you for sharing this information. 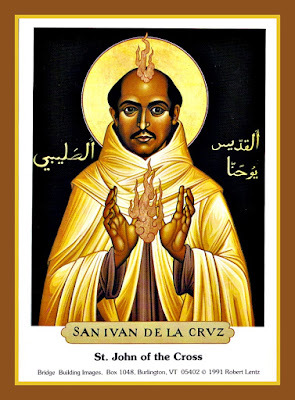 I hope others appreciate learning more about St. John of the Cross also. Why are words written in Arab at this icon? He was Spanish, not Arab. Meldelen - I don't know. Interesting question.